The world is celebrating Aretha Franklin because of who she is and what she represents to music and Black culture. Her talent has stretched across many genres of music and affected many soundscapes. Rap music is not absent from that discussion. Many of the driving rhythms and melodic music of Franklin’s have added to the tapestry of this art form we call rap and the culture of hip-hop. 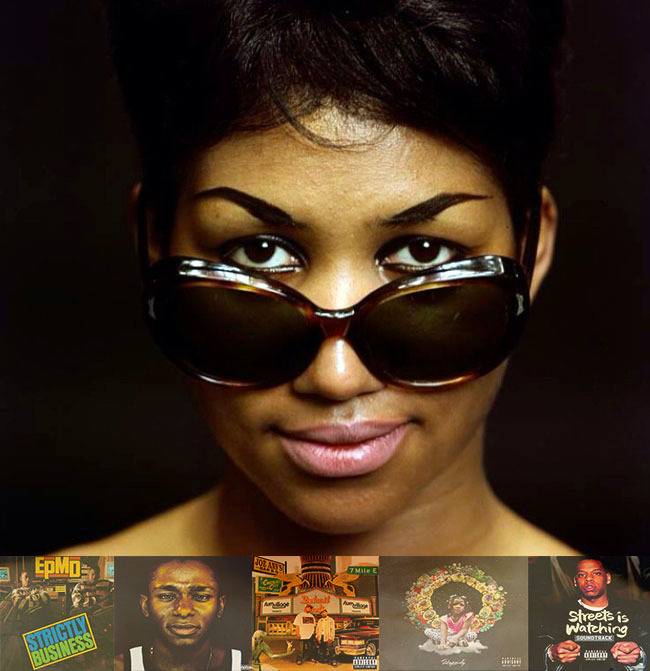 Let’s take a look at the top five rap songs to sample The Queen of Soul. While the world is singing “Respect,” arguably Aretha Franklin’s greatest hit, the song that resonates with this writer is “Rock Steady.” The rhythm is timeless and has made for one of the perfect breakbeats for rap. EPMD sampled “Rock Steady” on their classic release Strictly Business in the song “I’m Housin.” The funk is preserved and still remains hip-hop. Ms. Franklin’s song “One Step Ahead” is an ode to avoiding heartbreak and preserving a love. Ayatollah produced “Ms Fat Booty” which contains elements of “One Step Ahead” for Yasiin Bey, formerly known as Mos Def, and appears on his album Black On Both Sides. This song is arguably Yasiin’s biggest hit. The song tells the story of a young brother shooting his shot to a beautiful woman. The way Aretha addressed the subject of love you can tell that it comes from a heartfelt and emotional place. Her song “Call Me” is a song of anticipation, a song where you find a woman yearning for her love just by asking for a phone call. On “Young Gifted and Black” we find Aretha steeped in her gospel roots. She celebrates the beauty of Blackness at time when Black Power was the mantra of the culture. DJ Premier sampled the song for Gang Starr’s Daily Operation album on a 30-second joint called “92 Interlude.” I always felt like that would be an awesome song. Most recently you can find the vibe on the 9th Wonder-produced “Laila’s Wisdom.” It appears on Rapsody’s debut project by the same name. “Oh Baby” is yet another song where we find the Queen lamenting over love. The producer Ski skillfully plants her vocals across the production of Jay-Z’s song “In My Lifetime (Big Jaz Radio Mix) from The Streets is Watching soundtrack. This is rap at its essence, and the soul was able to traverse the genres effortlessly. This entry was posted in Music News, Uncategorized and tagged Aretha Franklin, hip-hop, Jay Z, kanye, rap by Precise. Bookmark the permalink.